This is nobody at my parish and nobody anybody else really knows...just some friends. Please, no emails asking who it is. Just pray for my family. I want to now continue something Anselm began awhile back but that I have never had the time to dig into: issues relating to the 1302 bull Unam Sanctam and the issue of the necessity of being subject to the Roman pontiff for salvation. If I were one of those persons who believed that the post-Vatican II Church had officially changed its teaching, who believed that the popes had gone off into apostasy and that the Chair of Peter was now vacant, I think this is where I would take my stand. This discussion (in my opinion) is quite a bit more complex than the arguments based on Quo Primum and like liturgical matters. Therefore, I am going to go slow and take as long as is needed to weed through the many issues that surround this controversy and see if we can't get to the bottom of it. Furthermore, we declare, we proclaim, we define that it is absolutely necessary for salvation that every human creature be subject to the Roman Pontiff. Click here for the whole document from the medieval sourcebook. The real bone of contention is that this document clearly and unambigously states that every person must be subject to the Roman pontiff for their salvation, while Vatican II seems to claim that non-Catholics can be saved without this subjection. Therefore, the Church has contradicted itself. Today we are only going to get our feet wet and ask ourselves an important preliminary question: to whom does this statement apply? It is common to begin discussion about this bull by putting it in the context of the struggles between the papacy and the secular authorities that were endemic throughout the middle ages but especially fierce in the late 13th and early 14th centuries. This is a bull primarily about the relationship between Church and State. However, that being said, the first thing I want to address with this bull is the simple fact that just because it happens to address a very dated, time-specific issue (the relation between Church and State in the middle ages) that in no way means that it cannot be considered to contain an infallible statement. Many commentaries I read on Unam Sanctam attempt to get around the infallible declaration by stating "this has to be taken in context of the historical period in which it was written." I agree - we always need to put things into a historical context. But what does that have to do with whether a statement was infallible or not? After all, we could say, "The Nicene Creed? Yeah, don't take that too strictly. After all, we have to keep in mind that it was originally composed to address the Arian controversy raging in the middle 4th century in the east." Sure, but that doesn't have any relation to the status of its veracity as a guide for faith. In the same way, simply pointing out that Unam Sanctam was written to address Church and State relations between France and the papacy does not really bear on whether or not this statement is infallible. I'd say most infallible declarations are made in response to specific, historical circumstances, wouldn't you? The declarations of Trent all had the Protestant Revolt in mind. This so commonly brought up issue of the "historical context" is simply a moot point. When the Pope uses the language we declare, we proclaim, we define then we are getting into a statement that transcends historical circumstances. Historical circumstance may give rise to infallible pronouncements, but it does not negate them or explain them away once they are made. To get back to the question of to whom the pope is speaking here, I think the above has established the fact that, whatever particular circumstance he may have had in mind, he was in fact making a universal declaration to the whole Church, as established by his use of the traditional formula for making infallible declarations. But now that we know to whom he was speaking, let us ask about whom is he referring when he says "every human person?" Only in this insane, backwards and ignorant world of modernity would we even have to ask such a question as "Duh, who is the pope talking about when he says 'every human person'?" I have the answer! How about every human person. I am only bringing this up because I want to address the following excuse: Well, the pope can only declare things binding on Catholics, and so when he says that "every human person" must be subject to the pope, he is really saying that every Catholic must render obedience to the pope. He is not making a statement about non-Christians. In fact, salvation outside the Church is really not even an issue in this bull." I read a lengthy essay by an apologist today who was taking this angle. I suppose it is a variation of the "historical circumstance" argument, but instead of saying it is not an infallible statement, it asserts that it doesn't really apply to everybody. Unam Sanctam was addressed to Catholics and should be understood in that context and, as I understand, the point of absolute necessity should be withstood wholly within that context and not referring to anything outside of that context. I.e., subjection to the Roman pontiff is absolutely necessary for the salvation of Roman Catholics (but not for anybody else). I'm not going to link to the source because the author will probably find this post and want to engage in a fruitless debate that will take 50 combox messages and hours I don't have. But at any rate, I have a hard time accepting the notion that "every human creature" means "every Catholic." This gets to the very heart of what papal infallibility means. Papal infallibility is not a charism that applies to contexts, or historical circumstances or what we think the pope was getting at; it applies to his words. What I mean is this: suppose the people who say that we need to understand Unam Sanctam only according to its historical circumstance are correct - suppose the Pope never meant to make a universal declaration about salvation in general. Suppose it never entered his head to do so and he really was only making a statement about the relationship of the royal authority to the papacy. The way I understand it, none of that matters. The fact is, when all is said and done, the Pope said "every human creature" and did so in the context of an infallible declaration. Therefore, whatever his intentions may have been, whatever the circumstances were, we have to admit that this statement is infallible exactly as they stand. I'm not saying that infallible statements do not sometimes need to be understood with reference to external facts, but going from "every human creature" to "every Catholic" is quite a leap. What good would our infallible declarations, the decrees of the Councils and the Fathers be if we could say "every human creature" means "every Catholic?" They'd be worthless. Infallible statements are meant to help truth be easier to distinguish. If we were to understand that infallible statements could be understood not according to their literal wording but according to what we suppose the pope may have meant when he said them, everything would come unraveled. Isn't this the whole "spirit of Vatican II" logic all over again but applied to something different? First, the statement we are discussing fits all the criteria for an infallible statement and should be regarded as such (unlike my college history professor, who laughed at the notion that Unam Sanctam was infallible but held Gaudium et Spes in very high regard). Second, we ought to admit that this document does indeed make a universal statement about salvation in general that pertains to all mankind. Perhaps Pope Boniface did not mean to make such a statement, but the simple fact is that he did, and we have to take it as it is and not try to get around the actual wording, for the actual wording is what is guaranteed by the Holy Spirit. Okay, so I know I did not get into the theological meat of the document at all, but we have to get these issues out of the way now before we can proceed. Next time I'll take a look at the theological import of the document. 1. 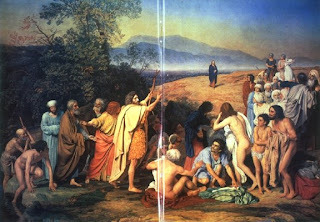 The liturgical legislation in force does not foresee this innovation, which in addition to being 'praeter legem' is contrary to a balanced understanding of the season of Lent, which though truly being a season of penance, is also a season rich in the symbolism of water and baptism, constantly evoked in liturgical texts. 2. The encouragement of the Church that the faithful avail themselves frequently of the sacraments is to be understood to apply also to the season of Lent. The 'fast' and 'abstinence' which the faithful embrace in this season does not extend to abstaining from the sacraments or sacramentals of the Church. 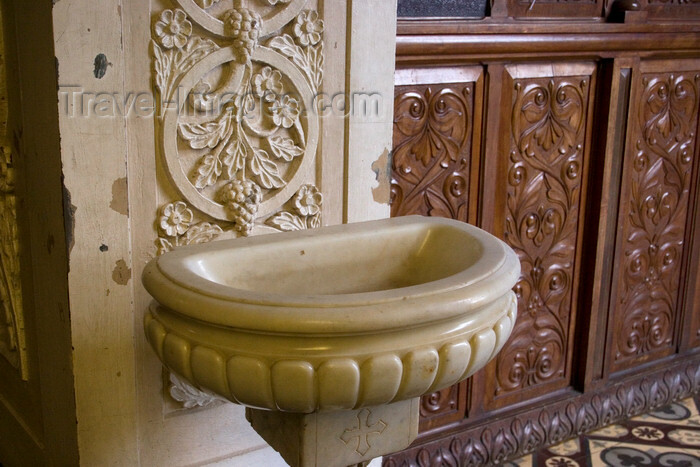 "The practice of the Church has been to empty the Holy Water fonts on the days of the Sacred Triduum in preparation of the blessing of the water at the Easter Vigil, and it corresponds to those days on which the Eucharist is not celebrated (i.e., Good Friday and Holy Saturday)." I found this linked up on Zenit here (at the bottom of the article), but the same statement is easily available from many other sites including Fr. Z.
I was talking with a co-worker yesterday who attends St. XXXXX Church. When she told me that they have "new stations of the cross", I thought she meant they had new stations installed... but no - she said they dropped 2 of the old stations and added 4 more, which I think means they now have 16 stations! I did some googling on 16 stations, but all I could find was reference to JPII instituting 14 stations based on scripture. What do you know about 16 stations? Does anybody out there have any experience or knowledge about parishes dropping stations and arbitrarily adding new ones? This is something I had never heard of before, though nothing seems to surprise me anymore. We have not heard a lot from Archbishop Malcolm Ranjith lately, but I just came across this English translation of an interview he did with the Italian Newspaper La Repubblica on 31 July, 2008. The interview was conducted by Marco Politi. The signal was unmistakable. First, it was seen on Corupus Christi in Rome; then it was seen by the whole world in Sydney. Benedict XVI requires that we he gives Communion, it be received while kneeling. This is one of the many things that this Pontificate has recovered: the use of Latin, the Tridentine Mass, the celebration of the Mass ad orientam, and so forth. Pope Benedict - the former Cardinal Ratzinger -has a plan, and Archbishop Malcom Ranjith summarizes it well. Does receiving Communion while kneeling move in this direction? R: There is a feeling, a need to recover the sense of the sacred in the liturgy, especially in the celebration of the Eucharist, because we believe that what takes place on the altar goes much farther than what we can humanly imagine. Therefore, the faith of the Church in the Real Presence of Christ in the Eucharistic species must be manifested through appropriate gestures and behaviors that are different from those of daily life [Which goes against the conventional wisdom that says we must incorporate gestures from daily life in order to make the liturgy more accessible]. Should we show that we are in the presence of something different? R: We are not standing before a political leader or a modern celebrity, but before God. 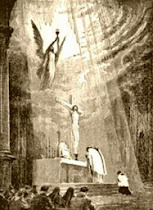 When the presence of the eternal God descends upon the altar, we must place ourselves in the best posture to adore Him. In my native culture, Sri Lanka, we must bow down with our heads to the ground, as the Buddhists and Muslims do when praying. Does giving the Sacred Host in the hand diminish the sense of the transcendent nature of the Eucharist? R: In a sense, yes. It disposes the communicant to sense the Eucharist almost as if it were just bread. The Holy Father often speaks of the necessity of safeguarding the sense of 'otherness' in every liturgical expression. The gesture of holding the sacred Host and placing it in the mouth ourselves, instead of receiving it, reduces the profound meaning of Communion [This is interesting. Most arguments against Communion in the hand center on the issue of particles left over and it being sacriligious, etc. Ranjith seems to be saying that there is another danger - symbolically, the simple act of holding the Host and self-communicating, even if in theory it could be done without any particle problems, still sends the wrong message. We feed ourselves with our own hands with regular food all the time - Communion should be different to accentuate the reality of Lord's presence. Self-communicating symbolically says, "This is just like everything else I put into my mouth with my hands"]. Is there a plan or an intent to counteract the process of secularizing the Mass? R: In some places, the sense of the eternal, the sacred, or the transcendent is being lost. In the past, there has been a tendency to put man - and not the Lord - at the center of the celebration. But the Second Vatican Council speaks clearly about the liturgy as 'actio Dei, actio Christi.' Instead of that, in certain liturgical circles, whether because of ideology or because of a certain intellectualism, the idea has spread of creating a liturgy adaptable to various situations, in which we must leave room for creativity so that it may be accessible and acceptable to everyone. Then also there are those who have introduced innovations without respecting the sensus fidei and the spiritual sensibility of the faithful. The modern danger is the priest thinking he is at the center of the liturgical action. The Mass is not theater, nor the priest a TV host. The celebrant sees that the people look at him as if he were the point of reference, and there is a risk that, in order to have the greatest success possible with the public, he make up gestures and words as if he were the central figure. What would be the correct attitude for the priest? R: When the priest knows that he is not the central figure, but Christ. Respect for the liturgy and its rules, in humble service to the Lord and the Church, as something received and not invented, means leaving greater room for the Lord so that, through the instrument of the priest, He can enkindle the faith in the mind of the faithful. 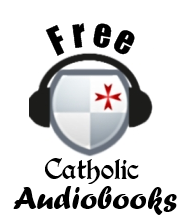 It is a year now since the full reintroduction of the Tridentine Mass [remember, this interview was in 2008]; what is the assessment? R: The Tridentine Mass (EF) has its very profound internal value which reflects the whole tradition of the Church. There is more respect toward the sacred through gestures, genuflections, and moments of silence. There is greater room reserved for careful deliberation on the Lord's action and also for the celebrant's personal devotion, who offers the sacrifice not only for the faithful but also for his own sins and his own salvation [Did he just say that the EF is intrinsically more reverent than the NO, or did I miss something?]. Some important elements of the old rite can also help us reflect on the manner of celebrating the Novus Ordo (Ordinary Form). We are in the midst of a journey [I get what he's saying, but he could have found a better choice of words...this sentence just makes me think of that hokey song "Jerusalem My Destiny"]. Can you foresee in the future a rite that brings together the best of the old and the new? R: That could be the case, but perhaps I won't see it. I think that in the coming decades there will be a comprehensive appreciation both of the old and new rites [notice how he slips into talking about two rites here? 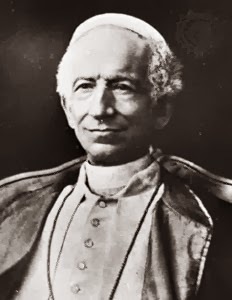 ], safeguarding whatever is eternal and supernatural taking place at the altar and reducing any desire of the priest to be center stage so as to leave room for an effective contact between the faithful and the Lord through the figure of the priest, who does not predominate. 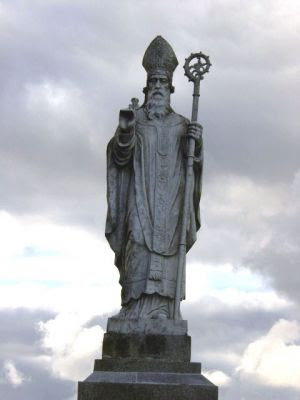 This is the best day to be Catholic for me personally, for several reasons: St. Patrick is the patron saint of our parish, Ireland is my favorite of all Catholic countries in the world, St. Patrick is the model missionary for the Church, and I am part Scots-Irish. Last year I did a series of posts on Ireland and Irish Catholicism, which are linked up below. Have a blessed St. Patrick's Day! St. Patrick, ora pro nobis! This week my next door neighbor told me that he had lost his house. This surprised me, because he is a plumber and had given me the impression that he was making very good money. He was always talking about how he made $178 for forty minutes of work or how he just got a $9000 contract and stuff like that. The whole time I have lived by him (2 1/2 years) I thought he was doing fine. Upon inquiring more, I found that the reason for his foreclosure was not that he lacked work, but that the companies he did work for refused to pay him. He had $60,000 in uncollected invoices that were out there and the companies that owed it simply were not paying him. This is a common problem for people who work in conrtracting - performing a service and then having to pester to collect - I am told that it is not uncommon to have $100,000 of invoices out and only be able to collect on $30,000 worth of them. I suppose it's part of the business. But now that times are bad, it is even worse. I would like to point out something about my neighbor's unfortunate situation. Liberals have been blaming the mortgage crisis on "predatory lending" and making it sound like the people who are losing their homes are victims who were swindled into mortgages they couldn't pay down the line. This may be true for some people, but it certainly wasn't the case for my neighbor. Not everybody who gets a hard lot is some kind of victim, especially not the kind of victim where we can easily point a finger at somebody and accuse them of doing it to us. But liberals only tend to see things in terms of one group of people oppressing another, and so it at least makes some kind of internal logical sense that this crisis could be blamed on predatory lending. But my neighbor had a regular mortgage and wasn't prey to anything like that. On the other hand, conservatives tend to accuse the people who are losing their homes of living beyond their means; thinking that everybody going into foreclosure was trying to live high on the heap and had expensive homes, vacation properties, extra bathrooms they didn't need, needless luxuries and things of that nature. While the liberals try to arouse sympathy in us for all the people losing their homes, the conservative emphasis on the irresponsibility of persons who took out mortgages that were too big for them is a way to try to say that the people who are losing their homes somehow deserve it. Again, this may be true for some, but it is not the case with my neighbor. He did not get into a 5 year ARM in order to squirm into a house that was way out of his class, nor was he trying in anyway to live beyond his means and mortgage a massive luxury house he couldn't afford; his home is modest, like mine. He wasn't greedy, nor was he taken advantage of. Both sides seem to be trying to find someone to blame for everything, but the fact is, sometimes stuff just happens that is nobody's fault. 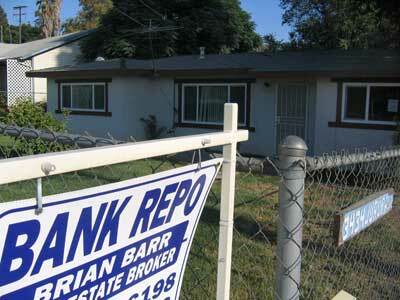 My neighbor didn't get into an irresponsible mortgage, nor did the mortgage company try to cheat him. Through factors beyond his control (the companies he does jobs for losing their business), his income has dried up and has forced him out. That's just the way it is, and we don't always need to be trying to find out who caused it. It's just a fact of life that sometimes we win and sometimes we lose, only modern man doesn't have the spine to acknowledge this. For us, if things don't go our way, we have to find somebody to blame. The fact is, nothing is secure in this world. As I was driving home tonight thinking about friends I had lost in the past several years, I reminded myself that God is in control. There is no guarantee on anything. No guarantee that I will live to see tomorrow. No guarantee that God will not strike dead both of my daughters before they reach maturity, leaving me bereaved and alone. No guarantee that I will not fall victim to some disease or accident that could leave me crippled or maimed. These are seriously the kind of things I remind myself of daily. There is certainly no surety that I will keep my house, whether I have a good mortgage or not. There is, however, one certainty: that whatever comes from God's hand is for the betterment of my soul, even if it means suffering. And this is perhaps where Catholics depart from some of our Protestant brethren - for many external suffering is something from the devil that is to be tolerated but ultimatey rejected. 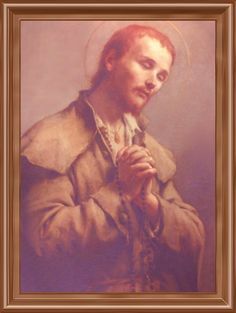 For Catholics, suffering is an opportunity to see the hand of God at work, who wills at times that we should suffer in a variety of ways in order to conform us to the image of His Son, so that in a mystical way, as St. Paul tells us, we may "make up what is lacking in the sufferings of Christ" (Col. 1:24). Following in the footsteps of the Master to become more like Him. The world and all things in it are transitory, and when things go bad, the best thing is probably not to start wondering about who's fault it is and who you can pin it on, but to seek to glorify God in and through it and recognize that we have no abiding homeland here. At least my neighbor seems to have taken this approach to it: while not a practicing Christian, he seems to have just thrown up his hands and said, "That's the way it goes sometimes." He is not embittered by the experience, but is simply seeking to restart somewhere else without any chip on his shoulder or feeling that anybody "owes" him anything (well, perhaps except the companies who owe him $60,000 in unpaid invoices). Please pray for him and for all persons who are in danger of losing their homes, for whatever reason. The big news in the SSPX excommunications in the past week and a half is that Pope Benedict has placed the Pontifical Commission Ecclesia Dei under the jurisdiction of the Congregation for the Doctrine of the Faith. The liberal media has been trumpeting this as the Pope disciplining a commission-run-wild, at which he is angry over the Bishop Williamson debacle. But what I wonder is this: has it been stated anywhere by anybody with any authority that the decision to place Ecclesia Dei under the authority of the CDF was in fact a disciplinary one? The popular take on this is that this was Benedict's way of disciplining a commission that was a loose cannon, as if Cardinal Castrillon Hoyos was doing all the footwork in preparation for the lifting of the excommunications without Benedict's knowledge. In the secular mindset, being placed under somebody else is always an insult because everything is about a power struggle. But has anybody in the Vatican actually said this was a disciplinary move by the Pope? I think it actually could be strategic. By placing PCED under the jurisdiction of the CDF and not the CDWDS, Benedict has connected issues relating to the Traditional Latin Mass with doctrine, not discipline. This is interesting, because it says two things to me (1) This may be a move to show that the Pope is serious about addressing the deeper theological issues that still divide the SSPX from the Church, and (2) It may prove an occasion for a broader, more general (and I think more important) explication of Vatican II itself. How long have faithful Catholics been wishing for the Pope to give some sort of authoritative interpretation of Vatican II to the Church to put an end once and for all to all the anarchy? I think the SSPX situation could provide Benedict with the opportunity and pretext to have this discussion about this elephant in the room. It seems that positioning PCED under the CDF could be the first move in preparing the Church for addressing the real question that has begged resolution for the past forty years. Therefore, I am not entirely buying the idea that the movement of PCED is punishment, though I may of course be completely ignorant and mistaken. 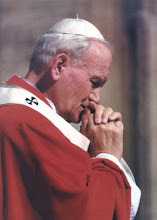 Think about the possibility for important clarifications that could arise from a doctrinal discussion with the SSPX - the Church could clear up confusion about ecumenism, interreligious dialogue, liturgical issues and the role of the Church in the world and the true interpretation of the documents of Vatican II. I dialoguing with the SSPX openly on the level of doctrine the Pope would have to address these issues, and knowing Benedict, the statements he would make would be concise and unambiguous affirmations of tradition with an emphasis on righting errant interpretations of Vatican II, both those which reject it and those which treat the Council itself as a super-dogma. I am glad the PCED is now under the CDF and I hope this is laying the ground work for an important doctrinal clarification of Vatican II, which could happen in the context of a SSPX dialogue. Me with Bishop Earl Boyea of the Lansing Diocese at the Rite of Election in Dexter, MI., Saturday, February 28th, 2009 welcoming the candidates and. catechumens of our parish who are preparing to enter the Church on the Easter Vigil. From the Sunlit Uplands: "The last act of the French Revolution came to a close on March 12, 2009, but hardly anyone was watching. The demonic forces unleashed over two hundred years ago took on the aim of destroying all monarchial authority in Europe. The rulers of the once Christian nations of Europe, or at least their governing authority, had all been executed, except for the tiny nation of Luxembourg. On March 12, without much fanfare, the parliament of the Grand Duchy of Luxembourg voted to end government of their small nation by the Grand Duke. Luxembourg was the last European nation to be governed by a real monarch. Although the tiny nation has had a parliamentary chamber, that body functioned as parliaments were originally designed to function. It was an advisory body to the Grand Duke. After new legislation was voted on by the Chamber of Deputies, Article 34 of the Constitution stated: “The Grand Duke sanctions and promulgates the laws. He makes his resolve known within three months of the vote in the Chamber.” This provision permitted the Grand Duke to perform the proper function of a monarch in a mixed form of government. He served as a check on the potential excesses of political parties legislating when they encroached on the principles of the natural law. As a hereditary ruler for life, the Grand Duke is immune from elector politics. He can thus serve as an outside supervisor of the results of the legislative process. This is exactly what he did last year in an act which precipitated the March 12 vote. In 2008, the Chamber of Deputies voted to approve a law which authorized the intentional killing of human beings, commonly referred to by its morbid proponents as euthanasia. Such a law is contrary to the natural law. For, as St. Thomas observed in his Summa the civil law can not always punish everything that the natural law forbids but it may never sanction such evil. Now we know both by reason and divine authority that euthanasia is prescribed. It violates the first principle of the natural law - self preservation. The Church has confirmed this deduction of reason on several occasions by pronouncing euthanasia to be immoral. Even the sensus Catholicus of this overwhelming Catholic nation was clear; the populace of Luxembourg opposed the bill pushed through by the Socialist and Green parties. Henri, the current Grand Duke, fulfilled his moral obligation as a good Catholic monarch and refused to sanction this evil legislative act. As a reward for doing the right thing, the so called “conservative” Prime Minister, Jean-Claude Juncker, called for an amendment to the Constitution stripping the Grand Duke of his authority to sanction laws passed by the Chamber of Deputies. The March 12 vote approved the removal of the word “sanctions” from Article 34. Prime Minister Juncker made clear the intention was to remove the right of the Grand Duke to approve of or reject laws. According to Juncker he must be required to promulgate all acts passed by the Chamber. The Luxembourg monarchy has thus entered the realm of Walt Disney monarchs inhabited by the remaining figure heads of Europe such as England, Spain and Belgium. They can parade around for tourists in quaint costumes and live in nice palaces, but they have no authority to protect and defend their nation by governing it. The old sly tactics of the spirit of Liberalism were visible in the way this final act unfolded. The press and politicians called the Grand Duke’s prevention of this immoral euthanasia legislation a “constitutional crisis.” Now a constitutional crisis occurs when an official violates the norms and rules constituting the mode of government of a civil society. In this case the Grand Duke did not violate a single provision of the existing written constitution. He merely exercised his legitimate and rightful authority to withhold his sanction from a proposed civil law which is contrary to the natural law. And the reaction of Liberalism to his exercise of his legitimate right – strip him of that right! Liberalism has always been willing to grant freedom and rights so long as the recipients only exercise that freedom in accordance with the wishes of Liberalism. Post French Revolutionary Liberalism claims to stand for the “rule of law,” a phrase that purports to mean that rules are not to be changed merely to reach a desired outcome. The established rules of the game, Liberalism claims, are sacrosanct. In reality, the rules are changed whenever Liberalism does not get its way. Like a spoiled child, it picks up its toys, which it previously claimed to have given away, and goes home. A few years ago after several nations clearly voted to reject the proposed European Constitution, the forces of Liberalism decided that the right to vote on the proposed Constitution was no longer necessary. The Constitution was repackaged as a treaty needing only the approval of the governments of the member states, not a vote of the population at large. Ireland stood as the only exception and allowed the Irish people to vote and they said no. Even this vote did not stop the forces of Liberalism who vowed to find another way. Likewise, when Grand Duke Henri uses his legal right to withhold his sanction from a law, the right he thought Liberalism had conceded to his ancestors, the modern Constitution is seen for the illusion it is. He has the right for only so long as he does not actually use it. This pattern of give and take rights is as old as the French Revolution which began by proclaiming Liberty for all and then proceeded to guillotine those who did not use that Liberty in the way the Committee for Public Safety thought they should (i.e. by apostatizing from the Faith). Liberalism means the right to be Liberal (as defined and redefined by the reigning generation of Liberals). Fortunately for Grand Duke Henri, his confrontation with the old enemy cost him only his legitimate governing authority and not his head. Some Liberals have at least learned that the messy business of liberally severing heads always seems to turn on them, literally. 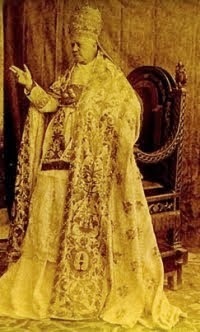 In lieu of tossing flowers to the Grand Duke as he makes his final bow on the decaying ruins of the theater of Christendom, I suggest all Remnant readers instead offer a rosary for His Highness that God, whose divine law leaves no good deed unrewarded and no evil deed unpunished, will bless him for his courage. While you are doing that, perhaps you can utter a prayer for the tiny population of Luxembourg who are now defenseless against the enactment of euthanasia laws and all the other gruesome ordinances of 21st Century Liberalism. These will all be possible now despite the will of their Grand Duke and, as in this case, even their own overwhelming sentiments. Libera nos ab potestate tyrannico liberalismi, Christus Rex." I just did a really excellent post over at Athanasius Contra Mundum on how the liturgical innovations of the 1960's were introduced into my parish, using parish bulletins and records discovered in a box in a downstairs closet as my source. It is really fascinating and debunks a lot of the myth associated with the reforms. Click here to have a look at it. 11... We so heartily approve the magnificent tribute of praise bestowed upon this most divine genius that We consider that Thomas should be called not only the Angelic, but also the Common or Universal Doctor of the Church; for the Church has adopted his philosophy for her own, as innumerable documents of every kind attest. Contrast this to Pope John Paul II's Encyclical Letter Fides et Ratio (On the Relationship between Faith and Reason), promulgated on September 14, 1998. 49. The Church has no philosophy of her own nor does she canonize any one particular philosophy in preference to others [footnote 54 reads: Cf. 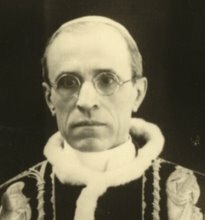 Pius XII, Encyclical Letter Humani Generis (12 August 1950): AAS 42 (1950), 566]. But, as Thomas G. Guarino rightly points out in footnote 11 (p. 64) of his Foundations of Systematic Theology: "At this point the encyclical, in note 54, cites "Humani generis," Acta apostolicae sedis 42 (1950): 566, as a supporting document. But one is hard pressed to read anything quite like the sentence indicated here. The theme of that passage is that although the terminology used in the schools is capable of further perfection and refinement, it is clearly the case that such philosophy provides a sturdy foundation for church teaching." Very interesting. Very interesting indeed. This month at my parish I gave two talks on successive Monday nights on the topic of the Sacred Liturgy. The talks were well attended and went over very well - regarding content, I did not really touch on anything that any reader of this blog probably wouldn't already know, but I have to say that some of the people who attended the talks were somewhat blown away by. 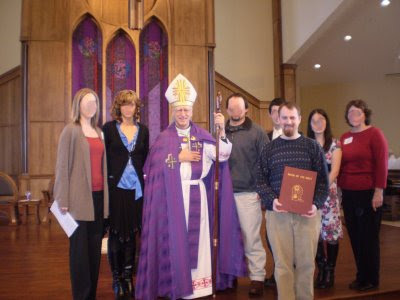 Myself and other bloggers of the traditionalist school have pointed out that conservative Catholics (a loose label which encompasses orthodox, faithful Catholics who get most of their information about Catholicism from modern Catholic media outlets) tend to place an overemphasis on the reception of Holy Communion at Mass as the most important element of the liturgy, as opposed to the offering of Christ to God the Father for the atonement of sins and for the repose of the Holy Souls. Thus, the focus is very much on the sacrament of the Eucharist with not so much understanding of the sacrifice of the Mass. This part of the talks proved to be the highlight of the evening as I watched people's faces light up with clarity as they perceived the important distinctions between the sacrifice and the sacrament in the Mass. I thought it might be fruitful to go over a few of them here. The sacrifice of the Mass and the sacrament of the Eucharist are closely united and difficult to distinguish, but they are nevertheless distinct elements. First, the sacrifice of the Mass is transitory, but the sacramental presence is abiding. The sacrifice of the Mass begins at a certain point and ends at a certain point within the liturgy, but the sacramental presence of Jesus abides even after the Mass so long as the sacred species remain. Therefore, we can say that Jesus' sacramental presence in the Eucharist is permanent while His sacrifice is temporary. Second, the two elements differ in to whom they are directed towards. The sacrifice of the Mass is directed towards God, as it is the very sacrifice of Jesus Himself offering Himself for the sins of the world, a perfect offering, to God the Father, and the Father receives it. On the other hand, the sacrament of the Eucharist is given to the people for their sanctification - or, if it is being exposed in the monstrance, for the adoration of the people. 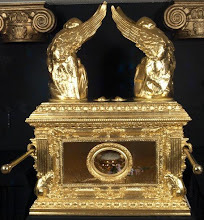 Finally, there is the fact that regarding the sacrament, the faithful are able to receive the Body and Blood of Christ fully by only partaking of one of the species, the sacred host, without the necessity of partaking of the chalice. This is perfectly acceptable, commendable and allows the recipient to share in the true Body and Blood of Christ. However, regarding the sacrifice of the Mass, the priest is obligated to consecrate both the bread and the wine together, even if nobody but himself were to partake of the chalice. This is because the sacrificial element of the Mass necessitates the offering of the Body and Blood of Christ under sacramental signs. A layman may receive only one element, but a priest may never consecrate under one only. I'm sure we all know these things already, but it is good to ponder these truths. Coming to a better understanding of the sacrifice of the Mass allows us to have more fruitful receptions of Holy Communion, while receiving Holy Communion with better dispositions will help us come to a more reverent appreciation of the sacrifice of the Mass and reap more of its fruits. It is a simple linguistic fact that Latin does not contain a word for the English definite article "the." 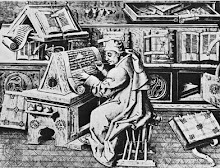 So in the Latin language, there is really no way to say "the book," for it is simply translated as liber. The concept of the definite article is implied in the word, and Latin certain has many other means of distinguishing the particular book from books in general (as anyone knows who has ever had Latin and had to memorize all the hic, haec, hoc and iste, ista, istud). But there is no separate word for "the." Therefore, I suppose technically it is perfectly acceptable to render the Latin phrase Jesum Christum in the Mass as "Jesus the Christ" since the word "the" is often implied in the Latin even though there is no separate word for it there. People fond of saying Jesus the Christ like to point out that Christ is not Jesus' last name, and therefore should not be used as such, and that it actually means "Anointed One," the Greek word for the Hebrew term Messiah. That may be true, but St. Paul does not shirk away from simply using the phrase "Jesus Christ" for the name of our Lord in Greek, and unlike Latin, Greek does have the definite article "the." But St. Paul still chooses to refer to Jesus as Jesus Christ, or sometimes Christ Jesus, even though he could have said "Jesus the Christ." There is nothing explicitly implied theologically by saying Jesus the Christ. Jesus is in fact the Christ, and I'm certainly not about to deny this. But I have noticed that the term "Jesus the Christ" seems to be the preference in parishes of a more progressive bent, and that some priests use it exclusively. I was at a Mass last weekend (not in my parish, by the way) in which the priest referred only to "Jesus the Christ" in the liturgy and even during the homily only used this term. The traditional "Jesus Christ" was never used once. It just felt weird. Here's why I think perhaps we should restrict ourselves from overusing this term. 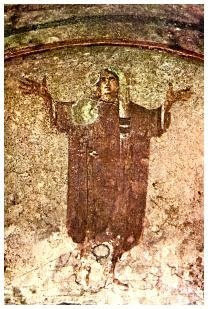 The traditional rendering "Jesus Christ" seems to better preserve the reality of the hypostatic union: the Anointed One, the Christ, is none other than the man Jesus of Nazareth. The Christ that comes from the Father is the same one born of a virgin in Bethlehem. Though of course we all realize that Christ is not Jesus' last name, it helps us to better speak of the mystery that the Christ the Word of God is essentially what the Man Jesus is. Just like when we say "Saint Francis" (instead of Francis the Saint), we are asserting that sanctity is the preeminent aspect of Francis' character that we are recalling. Now, saying "Jesus the Christ" does not deny any of this. However, I think this phrase does have a few undesireable aspects to it. Fundamentally, it separates the person of Jesus of Nazareth from the Messiah, even if only linguistically. It makes it sound like "Messiah" is an office that Jesus fulfills rather than something that He is. If this term were used exclusively, like I heard last weekend in Mass, people could get an adoptionist view of Jesus. Based on overuse of "Jesus the Christ," it could come to be perceived that the Christ was something Jesus became or that it was just an office he filled, just like when we say Isaiah the prophet. But Jesus is not "the Christ" in the same way that Isaiah can be called "the prophet." There was a time when Isaiah was not a prophet, and we can ontologically distinguish his office as a prophet from his personhood. But no such distinction is possible with Jesus, Who was the Christ from the moment of His conception just as He was the Word from all eternity. There is no Jesus without the Christ. But why do progressive priests tend to favor this term? Does anybody else notice this? This same priest who liked to say "Jesus the Christ" also preferred changing the word "Apostles" to "friends" in the liturgy. What is the connection with "Jesus the Christ" and progressive ideas? I think the key is archaeologism. Saying Jesus the Christ reminds people that Jesus is indeed the Christ, and that the Christ is the Jewish Messiah. Thus, when I hear "Jesus the Christ," I think this calls to mind the idea of the Jewish Messiah more clearly than the traditional Catholic formula "Jesus Christ." By calling up the idea of the Jewish Messiah, I think the notion is to get back to the way the "Early Church" would have thought of Jesus (I put that in quotations because progressive notions of the Early Church or often out of wack). Thus, I think using "Jesus the Christ" is an archaeologistic term that attempts to try to get past the "medieval accretions" (remember, the English "Jesus Christ" is the rendering of the Latin Jesum Christum). These same people who love saying "Jesus the Christ" are the same ones who love to refer to God as Yahweh because that's how they did it in ancient Israel (oh, except for the fact that nobody ever said that name because it was way too holy). By the way, the Vatican has disapproved of the use of "Yahweh" in liturgical songs, thank God! In the end, though the term itself is not errant, I think the too frequent use of it calls to mind a false vision of what Catholicism is: an organization of God's people that fell from its pristine and apostolic simplicity into the errors and superstitions of the Middle Ages and which now needs to be cleansed from these accumulated traditions (like saying "Jesus Christ"). I'm sure nobody intentionally thinks this when they say Jesus the Christ, and I sometimes will use this phrase when I am teaching if I mean to emphasize Christ as the Messiah. But there is something weird and a little disturbing about only using this phrase, and I think it ought to be generally avoided - especially if the liturgy calls for the traditional formula "Jesus Christ." Is there any substance here or am I making much ado about nothing? By the way, for something amusing, do a Google search for the phrase "The Messiah" and notice in the Images and on the Web how quick Obama comes up. On my post from a few days ago entitled "On the Sad State of Catholic Youth Ministry," I want to retract a statement I made regarding Kumbaya. I am told by someone who was at this event pictured in the video that the Kumbaya singing was a parody at a comedic event and was not meant to be taken seriously. I apologize for speaking about what I knew not. I do question the prudence of whoever put this video together, however. If the Kumbaya was not meant to be sung seriously and was not really part of the spirituality of the event, why include it in the promotional video without reference to its comedic context? Someone I was speaking to about this said that it was "obvious" that it was not meant to be taken seriously, but it was not obvious to me. After the bizarrity I saw at NCYC in Columbus, I am willing to believe anything! NCYC is not a monolithic event, but a huge convention in which over 500 separate organizations participate. Therefore, I will refrain as much as possible from making blanket statements about the entire event. I met wacko liberal-commies there, and some really good priests and nuns as well. I do not mean to characterize everybody who participates in these events as heretical or "wackos." I admit readily that there are many good and pious persons who participate in this event, as I mentioned initially. It is not the people I am condemning whatsoever but the ideological thrust of the event as a whole. If I speak with such vehemence against this type of thing, it is only because week after week I talk to kids from other youth groups who tell me how horrible this type of spirituality is and I run into Catholic teens all the time who are raised in this environment and who don't know the first thing about Catholicism. When I see NCYC, I see a spirituality that is destructive to souls, and therefore I call it out. But, in my zealousness to call it for what it is, I do not want to be uncharitable or hurtful, and so I apologize if I have come off that way. We must condemn what must be condemned, but must also remember that the judgment with which we judge will be the same judgment we receive. Therefore, when I see videos of people singing "Kumbaya," I ought to be lenient and say, "What is the best possible light I can interpret this in?" rather than assuming the worst. I apologize for my rashness. But the event still is horrible.